November 11 is observed as Veteran's Day in the United States, and as Armistice Day or Remembrance Day in other parts of the world. It was first commemorated for the signing of the armistice that ended the First World War, but later expanded to celebrate the veterans of war. To commemorate Veteran's Day, here a picture of the 10-foot bronze sculpture by Filipino artist Manuel Casas. 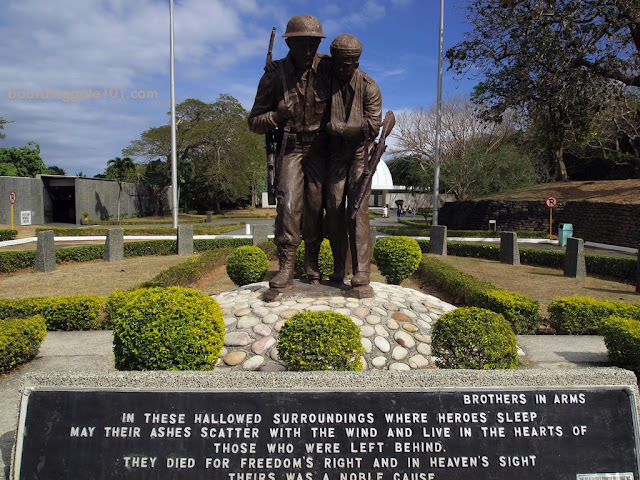 Located at the Fil-Am Friendship park behind the Pacific War Memorial in Corregidor, the sculpture was to memorialize the camaraderie and struggles of Filipino and American soldiers during the Second World War, but it seemed apt to honor those who served on this day as well. "In these hallowed surroundings where heroes sleep may their ashes scatter in the wind and live in the hearts of those who were left behind. They died for freedom's right and in heaven's sight theirs was a noble cause."